Spain has been at the forefront of modern gastronomy for many years but a few meals in the country quickly show you that it’s all about the avant-garde. Spain has a rich history of culinary traditions which translates to a mix of tasty dishes with influences from all corners of the globe. 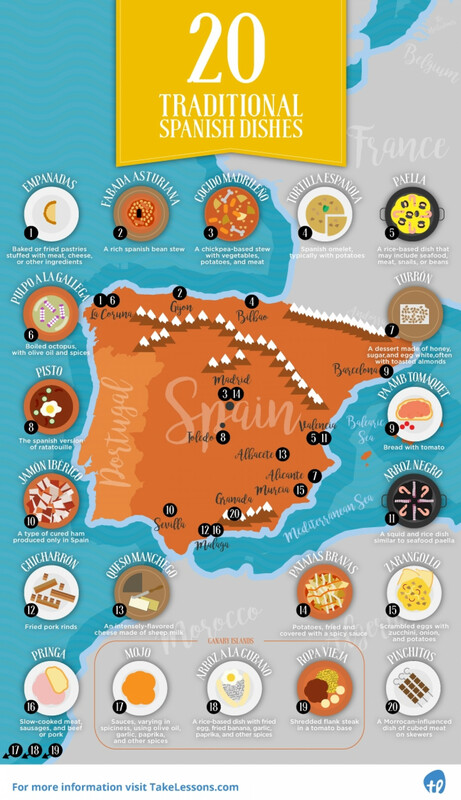 There are a collection of 20 different Spanish dishes on this food infographic by Take Lessons. Each one is illustrated and comes with a basic description on what it contains. It’s a perfect resource for anyone planning to travel to Spain or anyone who wants to refresh their memory on the diverse dishes on offer in the country. Enjoy and don't miss this other great stories about Spain.